Home › Blog › It’s Time for Summer Missions! Sterling United Methodist Church kicks off its summer Missions program this Sunday with a commissioning of the mission team members at the 9 AM service. 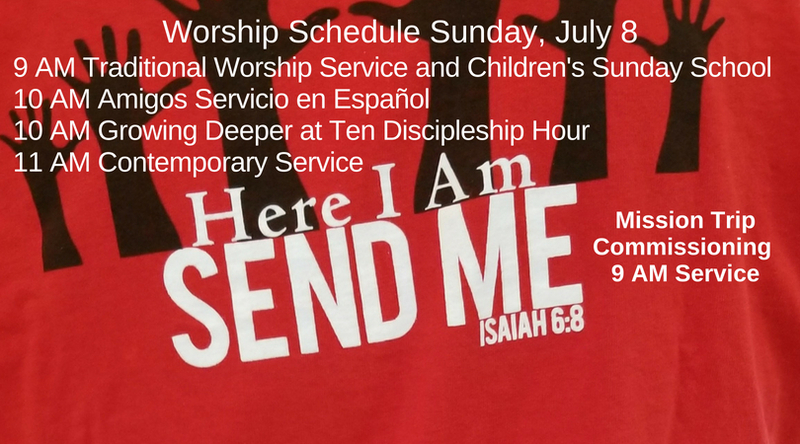 All trip participants and their prayer partners and those participating in local missions activities should attend the 9 AM commissioning. If you would like to be a prayer partner to one of our trip participants you can sign up here. This year’s mission program includes three back to back weeks of local and out of state service. Monday starts our week of local mission activities focused on the needs of those in our Sterling and Loudoun County community. Monday, July 9 is the Senior Citizen Luncheon and Bingo at noon. All seniors are invited to attend and enjoy lunch, fellowship, and bingo! Volunteers are needed from 10 AM until 4 PM. To volunteer click here. Tuesday, July 10 the team will work with LINK in the morning from 9 AM to 12 PM and with DeShong’s Gift Back in the gardens from 1 PM to 4 PM located at Sterling UMC and Gallilee UMC. Wednesday, July 11 will be spent at the Good Shepherd Alliance properties providing grounds maintenance. Thursday, July 12 we will work with Mobile Hope in the morning from 9 AM to 12 PM and the Loudoun Habitat Restore from 1 PM to 4 PM. Then on Friday, July 13 the Mission Team will assist with staging and set up for GRACE Ministries from 9 AM to 5 PM and the week will close with the Saturday GRACE Ministries food and clothing distribution from 7 AM to 1 PM. For more information on local missions volunteer opportunities click here. Then on Sunday, July 15 the first of our traveling mission teams will leave for Atlanta to work with the M25 Mission Camp where they will have the incredible opportunity to help some of the 20,000 homeless people in Atlanta. On July 22 the next team will leave for Baldwin, Louisiana and spend the week working at UMCOR’s Sager Brown relief-supply operations depot as well as their Thrift Shops and Food Pantries. In total, 24 team members will participate in the two out of state trips and many more will support the local mission efforts next week.